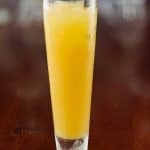 The Harvey Wallbanger is a classic 1950’s cocktail made with vodka, orange juice and Galliano a sweet anise-flavored liqueur from Italy. Pour the vodka and orange juice into an ice-filled collins glass and stir well. Float the Galliano on top.